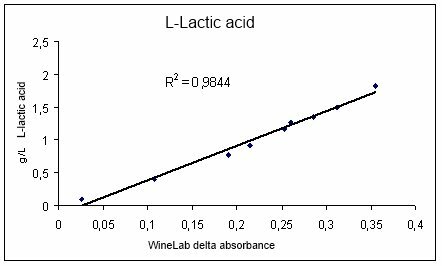 By analyzing L-Malic acid and L-Lactic acid, it is possible to assess the correct progress of the malolactic fermentation. The system is supplied pre-calibrated and ready for use. Results are expressed in accordance with the reference method. It is also possible to standardize the system using samples with a known titration. The analytical methods are simple: the system does not require an equipped laboratory or skilled staff. Time testing: one test 6 minutes – 50 Test/Hour. Are possible test sessions with several samples, up to a maximum of 16. The calibration curve of CDR WineLab®, obtained using reference methods. L-Lactic acid is oxidized in an alkaline environment through an enzymatic reaction and converted into pyruvate, which is turn produces NADH. The increase of absorbance, measured at 366 nm (end-point), is directly proportional to the concentration of L-Lactic acid in the sample. Why is malolactic fermentation so important? How can the biological and organoleptic stability be enhanced? Which bacteria are responsible for malolactic fermentation? What conditions favour malolactic fermentation? Follow up on the chemical and biological aspects of malolactic fermentation. Download the full text of the article. written by Dr. Simone Bellassai, CDR WineLab® specialist. L-Lactic Acid was last modified: February 8th, 2019 by CDR s.r.l.